The cover of the anniversary issue of Steeple Aston Life magazine - April 2015 - shows about two-thirds of the drawing of Steeple Aston made by Joseph Wilkins around 1867. On this page is the full version of the drawing that SAVA has produced with many of the buildings labelled – just about legible at this scale. Most of these labels give current or recent names to aid identification, except where the buildings concerned have since disappeared. Although Wilkins has tended to generalise the building forms, they are nevertheless for the most part quite accurate. His imaginary viewpoint hovers just over the paddock behind what is today Lawrence Fields, and looks north-west across the village, with what appears to be the church tower at Duns Tew just visible in the distance. Wilkins lived in Deddington and produced these birds-eye views and many other drawings on commission. 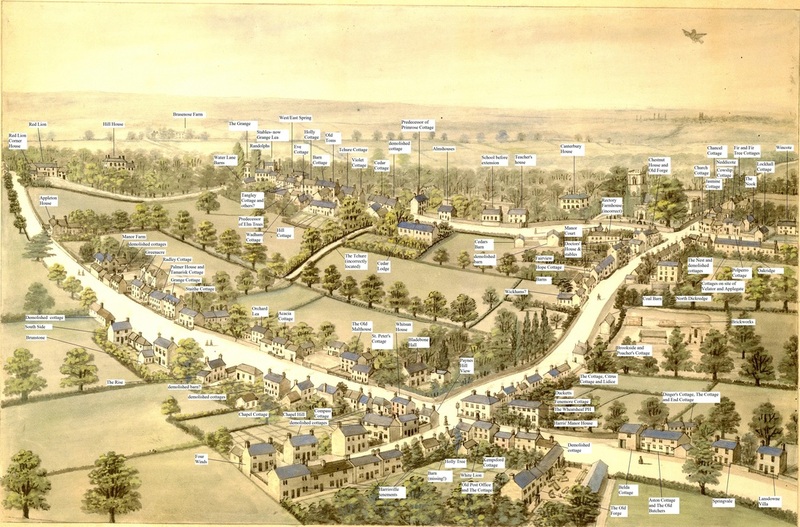 George Dew lived in Lower Heyford and his well-known diaries show that he paid Wilkins for other sketches in December 1866, including a birdseye view of Lower Heyford. It is likely that Dew commissioned the Steeple Aston view too, as the picture features Harrisville in the foreground, where his father John Dew owned two cottages. Eventually, Dorothy Dew – George's daughter – donated this and other Wilkins drawings to the Bodleian Library, whose permission we have to reproduce this wonderful record of how the village looked nearly 150 years ago, at a time when photography was still in its infancy. So what exactly does the drawing tell us? Let's start with Harrisville, as it was then called and still is today. As SAVA has written before in SAL, it became an overcrowded slum in late Victorian times. Most of the houses were demolished in the 1930s and families were rehoused in the newly-built Crescent. Harrisville was then renamed “The Lane” until more recent times. The drawing appears to show 21 small dwellings, mostly semi-detached, which if they had all survived till today would probably have become 11 larger homes for fewer than 30 people. Census returns reveal the reality in earlier times – 71 in 1851, 108 in 1881, and 144 people in 1891 – an average of 7 people per tiny dwelling. Even so, the 1871 census, closest to the date of this drawing, lists the population of the village as 922 people - a figure virtually identical to the 2001 census, a consequence of the housing estates built in the C20th. Also in the foreground is what we now know as “The Old Forge” in Heyford Road, which in 1867 was the wheelwright's yard run by James Durran (later bought by the Field family whose name is celebrated in the 1990s development next door). You can see a half-finished wheel in the yard, together with other paraphenalia. Looking back towards The Lane again, we see a lady in the street obviously wondering whether to fetch her husband from the Wheatsheaf public house on the corner of Paine's Hill. The pub sign clearly identifies the elegantly-proportioned building that more recently housed our village shop before being converted solely into a house, now erroneously called “The Old Manor House”. As an earlier SAVA article “Trouble at the Wheatsheaf” pointed out, it was in September 1868 that the Magistrates refused to renew the pub's licence, which further helps to date this drawing to a time just before that. The White Lion opened in 1870. Opposite the pub should be the little Holly Cottage barn on the corner of Harrisville, but Wilkins has unfortunately left this off his drawing. Let's take a walk now up South Side (incidentally - have you seen SAVA's guided walk on the group's website?). On the right is the big tree that kept Walton's butchers shop cool in the summer, and further along is Acacia Cottage with its flanking single storey additions, both showing their agricultural origins. On its right side, a barn has become the recently-renamed Jacob's Croft, while on its left side the building has not yet become the village reading room, which was still 20 years in the future. On the other side of the road are a pair of cottages later demolished to make way for Jubilee Close. Beyond the cottages in the photo is the little single-storey shop/ office we know today, but this is missing from Wilkins' drawing – and for a good reason. It wasn't built until about 1920! Retracing our steps to go up Paines Hill, we pass the Coal Barn and behind it the brickworks and its stacks of newly-made bricks drying in the sun. The terrace of cottages on the same side from there up to Cow Lane shows about twice as many buildings as exist today. The Doctor's House opposite is very recognisable, although Wilkins' rendering of the buildings at Rectory Farm doesn't seem quite right. Heading along North Street, as it was then, the original Dr. Radcliffe's School building with its large windows stands by the road, without the parallel extension behind it which wasn't built until 1877. Next come the almshouses, with Cedar Court opposite, and then we have a surprise: where Primrose Cottage stands today there is a three-storey house with its gable end facing the road. That this is correct is confirmed by both the 1768 Enclosure Map and the 1881 Ordnance Survey map of the village. By the time of the next edition - the 1900 map - Primrose Cottage as we know it now with its two-storey frontage facing the road had replaced the old house. The remainder of North Side is increasingly difficult to decipher, as Wilkins had to fit into a small area one of the most densely occupied parts of the village. At that time, the Gap was full of tenements and “rents”, rather like Harrisville. What is today “Hill Cottage” looks as though it was previously four dwellings. By contrast, just visible at the top of West Street (now Water Lane) is The Grange (shown with a triangular pediment that it has never had), and behind it the distinctive paired gothic towers that used to be part of the Grange Stables, demolished in the C20th, leaving only the part that is now Grange Lea.